Bring on the Night is a 1985 British-American documentary film directed by Michael Apted, focusing on the jazz-inspired project and band led by the British musician Sting during the early stages of his solo career. Some of the songs, whose concert rehearsals are featured in the film, appeared on his debut solo album The Dream of the Blue Turtles. Each musician in the band, through the course of the film, is interviewed. The film won the Grammy Award for "Best Music Video, Long Form" at the 1987 Grammy Awards. The film was released as DVD in 2005. 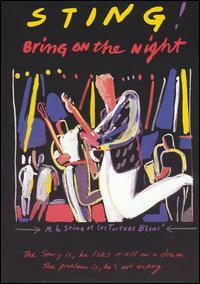 Bring on the Night is also the name of Sting's 1986 live album featuring music recorded during the 1985 tour chronicled in the film. This page was last edited on 29 June 2018, at 07:07 (UTC).